Kaziranga! The very name spells magic. Deep dark forests, filtered emerald-green sunlight, large acres of open grassland, swamps and wetland, and thousands of animals and birds coexisting in celebration of the splendid glory of nature. Spread across over 400 sq km, Kaziranga is home to several protected species of animals: among them the tiger (its largest concentration in the world is found here), the wild elephants, the water buffalo, the swamp deer, many species of birds, and most famously, two-thirds of the world’s one-horned rhino population. Nestled across the floodplains of the majestic Brahmaputra, between the districts of Golaghat and Nagaon in Assam, India’s North Eastern State, Kaziranga is plagued by regular flooding and by poachers who saw off the rhino’s horn, leaving the animal to bleed to death. The dedicated team of forest guards have less than bare minimum resources to save their much-loved forest and its animals from nature’s fury and man’s greed. They struggle, but as the book tells us, find it mostly a losing battle. For tourists like us, Kaziranga is a ‘must-see’ destination, so we can compare notes on how many animals we sighted, and fill our social media pages with photos. The government persists in allowing tarred roads to be built through our reserve forests, where speeding cars, buses and trucks flog their horns through the day and night, regularly knocking down and maiming or killing wildlife. Dileep Chandan has written this book almost as a documentary, wrapped lightly around a story of three friends and a Forest Officer. It is abundantly clear that the author’s heart bleeds for his beloved Kaziranga and he has sought a way through this book to send out a message to the world—to save it. There is a little romance too, for those who love human romances; but the real love in the book is the love of the people residing on the precincts of Kaziranga, for its wild beauty, its wonderful animals and serene water bodies; the heartaches their love faces when Kaziranga is overwhelmed by nature and tormented by humans. The story touches on every aspect of what ails our forests. There are villages nudging the periphery of the jungle, including newly sprung settlements where ‘outsiders’ have been given a place to live by the government. It is these outsiders, the author asserts, from whose midst the poachers rise, keen to make a quick buck, sponsored no doubt by agents outside of Kaziranga, perhaps outside of Assam or even India. The villagers, who have lived for generations around Kaziranga, on the other hand, in spite of living in abject poverty themselves, cannot imagine any harm coming to the animals. They love the forest; love the animals like their own, and cannot bear to see the government doing less than enough to protect them. They denounce the poachers and whenever possible, hand them over to the forest guards. There is Mother Nature’s devastation too. Each year the Brahmaputra overflows and causes havoc to the forest, eroding its banks and threatening the animals. And finally, there is the man-animal conflict, when hurt or unable to hunt, a tiger turns man-eater. As we humans encroach more and more into the forestlands we force the animals to clash with us, often resulting in death—first for the human and then for the animal who is hunted down and killed. The story of Kaziranga weaves through all these problems as seen through the eyes of its main characters. It is a tale gently told, and keeps the reader engrossed. 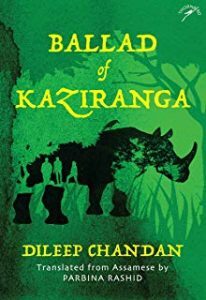 While each problem is portrayed, and the forest guard’s frustration and public ire described, yet the author clearly holds out the hope that one day, perhaps one day soon, the problems plaguing his treasured Kaziranga will be resolved and his rhinos will roam free, safe from lurking human predators. The spirit of optimism shines through the troubled story of this magnificent forest. The translation by Parbina Rashid is light and breezy and you can tell from reading it that the book was not written originally in English. There is a merry disregard for grammar and turns of phrase are used which will find no place in the English language. The editing could and should have been more stringent to improve the language and perhaps readership too. However, in spite of it all, The Ballad of Kaziranga is a book I enjoyed reading. for it is a tale that needs to be told. Malati Mukherjee is a writer, translator and sometimes a poet, based out of the Nilgiris.